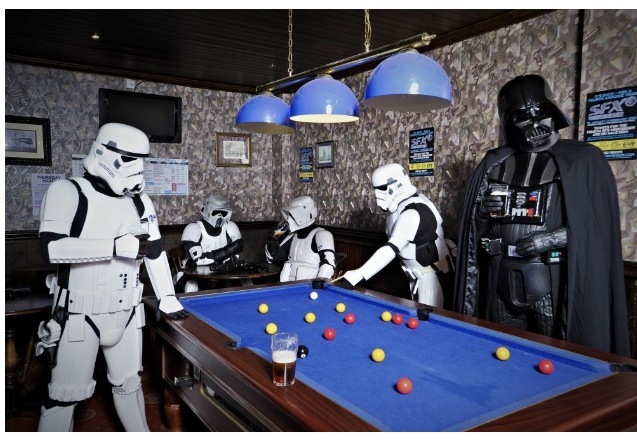 Darth Vader playing pool with his legion of Stormtroopers was just one of the many weird and wonderful things seen over the SFX Weekender, which took place in Prestatyn this weekend. Hosted by the world’s number 1 sci-fi entertainment magazine SFX, the weekend saw over 4,000 revellers descend on Pontins to immerse themselves in sci-fi culture. Now in its third year and sold out for the first time ever, guests enjoyed an array of entertainment from the likes of Brian Blessed, Eve Myles, Hattie Hayridge and Craig Charles. The Galactic Knights (pictured) also stole the show with their assortment of professional costumes. The Star Wars and Sci-Fi costuming group who bring together enthusiasts from all over the world paraded around the site in an array of outfits ranging from Star Wars to Halo Spartans, Dr Who and Batman.